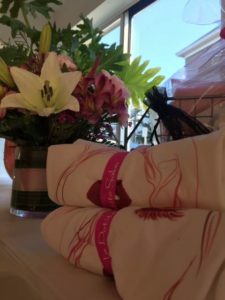 A couple weeks ago, Persnickety Promotions attended a fantastic Grand Opening celebration for our client, La Petite Salon, in Carmel, New York. 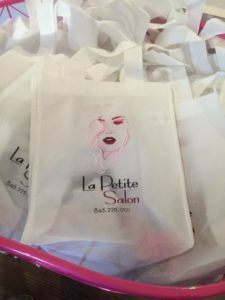 With the owner Lia’s visions, and Denise’s skill and attention to detail, they created a fun AND functional “swag bag” to get the crowds talking about this new hair salon. When starting a project, we always look at the key elements in a company (i.e. a logo, specific colors or slogan). The salon has a woman’s face as their logo with the words “La Petite Salon” so we knew it was important to have these elements appear wherever possible to make this project a whole. 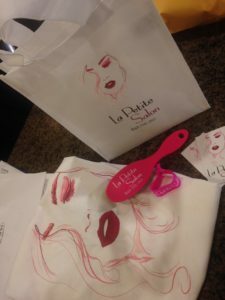 Starting with the hairbrushes, our client opted for their name and number only to appear on the back, rather than the image for the fear of it being too busy. The hairbrush itself is hot pink, calling upon the pinks found in the woman’s face and hair to create both contrast and unity. Although small in size, this hairbrush has a comfortable smooth handle just the right size for anyone to use without the struggle of letting go. The hair tie, also hot pink, is an elastic ribbon with a width that allowed us to screen print on. By putting the company name, it gives a full view to those who may just get a quick glance of the hairband but still gets the name across. This is a more elegant version of the “usual” thin elastic hair tie but has a stretchy-ness to it and will not unknot itself. Our third piece is a front and back screenprinted t-shirt we did in-house for our client. These shirts were part of the salon’s giveaway to further promote their brand. With the salon name on the front chest, the logo and the phone number were placed on the back for a full size view. To wrap it all up together is the tote itself. It’s sturdy nature and small shape makes it perfect to fit all the goodies inside. That about concludes our time for this post. See something you like? Feel free to contact us today!